A stylish Slim-Line magnetic two-pen counter unit with perpetual calendar comes complete with date and month inserts. Single or double sided calendar available. Solidly constructed of one piece of aluminum, it is available in three finish choices: satin clear (shown in image), satin black or satin bronze. Dimensions: 10" long x 2" deep. 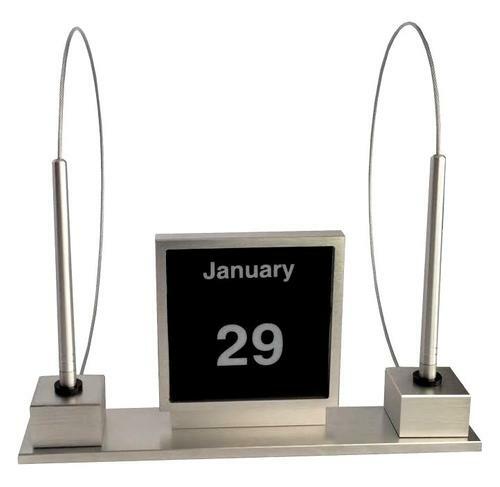 A stylish Slim-Line magnetic two-pen counter unit with perpetual calendar. Single or double sided calendar available. Solidly constructed of one piece of aluminum, it is available in three finish choices: satin clear (shown in image), satin black or satin bronze.